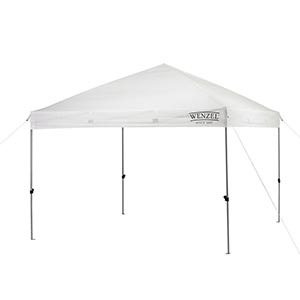 In this article, we will have a detailed Wenzel Smartshade Canopy 10 x 10 Review. All the major features of the product and their benefits will be told in detail. It has features such as sturdy steel frame which is developed to ensure the durability of the product. The shade made of Polyester fiber which is made to ensure maximum resistant against water and also against the ultraviolet rays of the sun. To make packing and transportation possible, a large rolling storage duffel is provided so that it can be carried easily. Wenzel Smartshade Canopy 10 x 10 Features. We have introduced some of the major features from Wenzel Smartshade Canopy 10 x 10. Let us take you to a detailed review of these features. 10 x10 Canopy with Pop up Shelter. The canopy’s dimensions are 10 x 10 which comes in large ones category and would be perfect for different events such as picnics with families and friends, different competitive tournaments, for placing stalls at festivals, and can even be set by poolside for family parties. Also, a large group of friends and family can fit under it because of its pop up shelter. Something which gives this canopy a real stand up and durability is a powder coated steel frame. This sturdy steel frame also comes with release buttons which are used to adjust the height of the frame. Yes, you can adjust its heights and it is always when you need the full length of the frame so keep it optimized according to your use. What makes this Wenzel Smartshade Canopy so amazing is its polyester built fabric which is durable and long lasting against the rain water and the ultraviolet UV rays of the sun. It will give you maximum protection from heat of the summer making it a perfect addition to your picnic arsenal. Some of the other features which do deserve a mention include mesh storage bag, polyester fabric, a rolling bag for packing and transport, easy to setup, and anchor points for screws. Polyester Fabric which holds out against rain and UV rays. Anchor Points for screws and skates. Duffel bag and a storage bag is present. Large size for large groups. Durable and strong steel frame whose height can be adjusted. Might go out of budget without any discount. Heavy to be carried to places. Its price maybe one of the factors which should bother most buyers as compared to other products. But, when it comes it features and quality, you can always rely on the product.